Eudora is a popular and feature-rich email program for the Mac and Windows. Qualcomm, the publisher of Eudora, has since stopped devlopment of the software. Newer versions of Eudora are essentially identical to Mozilla Thunderbird. Open Eudora. If this is the first time using the program, you’ll see a “New Account Wizard” window. If not, you can skip these steps and just enter the information into the Settings interface directly. In “Account Settings”, click Next. In “Personal Information”, enter your full name then click Next. In “Email Address”, enter your LMi.net address (for example, frankm@lmi.net), then click Next. 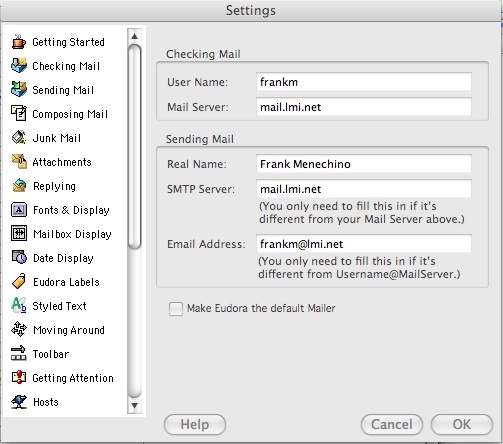 In “User Name”, enter your username (the part of your email address before the @; for example, frankm), then click next. In “Incoming Mail Server”, enter mail.lmi.net, then click Next. In “Outgoing Mail Server”, enter mail.lmi.net, and leave “Allow Authorization” checked, then click Next, then click Finish.